Looking for an easy breakfast recipe for this weekend? You're in luck! These bacon egg cups look super fancy, but actually take no time at all! 1. Pre- heat over to 350º and spray muffin tin with non-stick spray. 2.. Crack eggs into bowl and add all herbs and seasonings. 3. Whisk together until fluffy. 4. 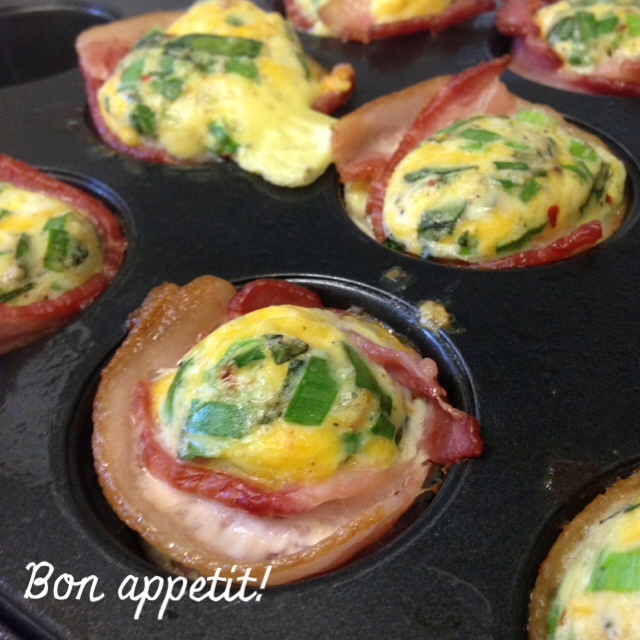 Using the halves of bacon, line the outside rim of muffin tins- one whole piece per cup. 5. Fill bacon lined cups 3/4 way full with egg mixture. 7. Remove from oven and serve immediately. Yum!! Thank you so much for sharing!! Love these. Mine don't ever look as pretty as yours though! I made these this past weekend and my husband and I both LOVED them and they are so easy!! I love making egg cups! perfect for the grab and go girl!